The Wine and Cheese Place: 2017 Rose wine! 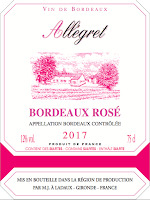 New 2017 vintage ROSE wines are starting to arrive! Brilliant salmon pink with rose petal highlights. The nose has intense apricot aromas with jasmine flowers. It is very delicious and satisfying and full bodied. The elegant fruity flavors are enhanced by a beautiful balance between acidity and fruit. Raspberry, Redcurrant and a touch of citrus flavours extend into a long fine aftertaste.